Bookings are £200 for a half day and £400 for a full day (+ VAT). If you're a charity based in Southwark or a business within Team London Bridge's BID area, different rates may apply. Please speak with a member of our team. Cleaning If your booking is of a nature which requires cleaning following the event, there will be an additional charge of £30 ph. Security If your require security during your event, this can be arranged. Please talk to a member of staff regarding costs. Dependent on format, the space can accommodate up to 60 people. The Hive is available for bookings 7 days a week from 8AM - 9PM. You can book through our enquiry form and a member of the team will get back to you as soon as possible. We're happy to recommend external furniture hire and catering options. Can I bring my own furniture and equipment? We want the Hive to be as versatile as possible; bringing your own furniture is welcomed. Unfortunately, we cannot allow any fixtures that will leave any marking on the walls or floors, however, picture hanging rails are available and we're happy to work with you to find alternative set-up solutions. This is a kitchen on site, however it is a very small space and not suitable for food preparation. If you are working with caterers they will need to prepare food offsite. We have a small fridge - please confirm with a team member if you need to use it prior to or on the booking day. We don’t provide catering, so you will need to make your own arrangements. You’re welcome to use any catering company, but you can find our local recommendations here. Please make sure the food is delivered during your booking hours and note that there is no fridge-space for storage. We have disposable plates, cutlery and napkins; please let us know in advance if you’ll need some. Yes. There are no steps to the entrance and there is an accessible toilet on the same level. Can I park my car in the area ? 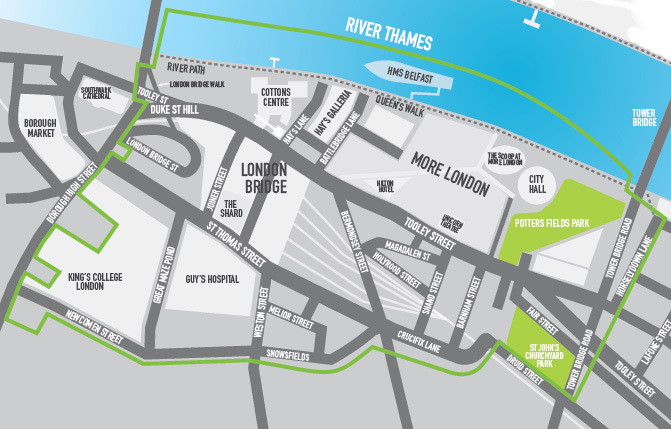 As we are located just 2 minutes away from London Bridge station, were would recommend that visitors and users utilise the transport links. Melior Place can be used for drop offs/ pick ups but not for parking; the area mainly comprises of parking bays for permit holders; there is an NCP Car park, rates may differ – you can check here. Please note that we are based in the Congestion Charge area. Would this space work for a small meeting? We wouldn’t recommend it for a meeting with less than 10 people, as the room is quite large and voices will echo if there are only a handful of people using it. Do you have another question? Let us know.